ALBANY, New York, December 18, 2014 (ENS) – As of early next year, New York State will be permanently off-limits to hydraulic fracturing, or fracking, for oil and gas. The decision follows the release Wednesday of a long-awaited Department of Health report that details adverse health and environmental effects from exposure to the process. Fracking involves horizontal drilling and the fracturing of underground shale rock with pressurized water and chemicals to release deposits of gas and oil. New York lies over the Marcellus shale formation, which extends for 600 miles along the Appalachian Basin. At a Cabinet Meeting in Albany Wednesday, Acting Department of Health Commissioner Dr. Howard Zucker recommended that high-volume hydraulic fracturing should not move forward in New York State. In 2012, Department of Environmental Conservation (DEC) Commissioner Joe Martens asked the Department of Health Commissioner to conduct a review of the draft Supplemental Generic Environmental Impact Statement for High-Volume Hydraulic Fracturing (SGEIS). Dr. Zucker’s report fulfills that request. As a result of the report, Commissioner Martens told the Cabinet Meeting that he will issue a legally-binding findings statement that will prohibit fracking in New York State. “For the past six years, DEC has examined the significant environmental impacts that could result from high-volume hydraulic fracturing,” Martens said. “DEC’s own review identified dozens of potential significant adverse impacts of high-volume hydraulic fracturing (HVHF). Further, with the exclusion of sensitive natural, cultural and historic resources and the increasing number of towns that have enacted bans and moratoria, the risks substantially outweigh any potential economic benefits of HVHF,” said Martens. “Considering the research, public comments, relevant studies, Dr. Zucker’s report and the enormous record DEC has amassed on this issue, I have directed my staff to complete the final SGEIS. 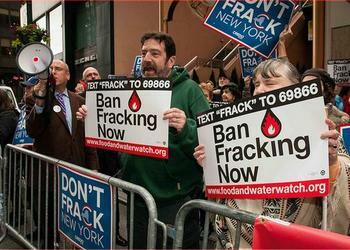 Once that is complete, I will prohibit high-volume hydraulic fracturing in New York State at this time,” Martens said. DEC will incorporate the findings of the public health review into the Final SGEIS, which will be released with a response to public comments early next year. Within 10 days, Commissioner Martens will issue the findings statement prohibiting fracking, concluding the State Environmental Quality Review Act process. At the Cabinet meeting, Governor Andrew Cuomo thanked the commissioners and their respective departments for their work. The Department of Health review found “significant uncertainties” about: the adverse health outcomes that may be associated with fracking; the likelihood of occurrence of adverse health outcomes; and the adequacy of mitigation measures to protect public health. The report concludes that it will be years until science and research provide sufficient information to determine the level of risk fracking poses to public health and whether those risks can be adequately mitigated. Given the red flags raised by current studies, and without conclusive studies that disprove health concerns, the report states that fracking should not proceed in New York State. In conducting its public health review, Department of Health officials reviewed and evaluated scientific literature, sought input from outside public health experts, engaged in field visits and discussions with health and environmental authorities in nearly all states where fracking activity is taking place, and communicated with local, state, federal, international, academic, environmental and public health stakeholders.